What is the conventional treatment for seizures? How has Epi-Still helped others? How long does a bottle of Epi-Still last? Although seizures are often thought of as dramatic events, there are a number of different types of seizures, some of which are much more subtle and difficult for an outsider to notice. A generalized seizure (Also known as a grand mal seizure, fit or convulsion) generally causes an acute decrease in state of consciousness, repeated movements of the body, excessive salivation, vomiting and often a loss of bladder and bowel control. This event may last from 30 seconds to a few minutes. The other main type of seizure is a focal motor seizure which is a much less dramatic occurrence. A focal motor seizure will cause just a repeated twitching movement in either the face or limbs and usually only lasts a few seconds. Absence seizures (which used to be called Petit Mal seizures) usually involve a short period of impaired consciousness, often accompanied by a staring expression and sometimes mild twitching of small muscle groups. A seizure may be preceded by warning signs known as an aura - this may include unusual sensations, smells or tastes. After a seizure, the individual may have a headache, sore muscles, experience unusual sensations, feel confused and tired. These after-effects are called the postictal state. Seizures occur because of a change in the electrical activity of the brain. This can be caused by a variety of things including diseases of the nervous system and the brain itself. Seizures may also be the result of a head injury, chemicals, poisons and even nutrient deficiencies. Often the underlying cause of epilepsy in an individual is unknown. Treatment for seizures will be directed at the underlying cause or disease in cases where this is known. Anti-epileptic drugs are used to prevent seizures which are severe or occur frequently. These drugs - also called anticonvulsants - are known to decrease the incidence of seizures as well as the severity. Certain of these drugs are useful in the acute or emergency situation of a seizure, but most are more commonly used on a day-to-day, prophylactic basis. Unfortunately there is no single, ideal anticonvulsant drug that can completely prevent seizures in all people. In fact, many people with epilepsy have to use a combination of drugs in order to adequately control their condition in the long-term. There are several types or “classes” of anticonvulsants grouped according to their mechanism of action. Some of these classes have other common uses as well and may be prescribed as tranquilizers, sleeping pills or even to control irregular heart rhythms. Anticonvulsants may be effective in a number of different ways. Some work by “slowing down” activity in all parts of the brain. Others make it more difficult for nerve impulses to spread from one nerve to another or alter the levels of chemical messengers (called neurotransmitters) in the nervous system. These mechanisms have varying success rates but can often - especially when used in combination - control epilepsy very effectively once an appropriate dose has been established and a stable blood level reached. As with most prescription medications, no anticonvulsant drugs are without side-effects. The most commonly reported adverse effects for these drugs include problems with coordination like dizziness, clumsiness, trembling and stuttering, changes in behavior, confusion and depression, appetite and weight changes, skin reactions, digestive discomfort and even hair loss. The major long-term danger of anticonvulsants is the risk of irreversible liver damage. Different classes of drugs cause different side-effects though there are a number of overlaps. This means that, while using a combination of drugs can improve effectiveness, it will also increase the chance of side-effects. The brain and nervous system do not exist in isolation - they are part of a complex group of systems that make up the human body. For this reason, it makes sense to maintain a holistic approach to health. After all, it is the body that keeps the brain supplied with oxygen and nutrients! So, by looking after our overall health and fitness, we can help the brain and nervous system to function properly. A healthy diet, (preferably containing mostly organic ingredients), is a good place to start – as is the maintenance of a regular fitness program geared to your body needs. Pacing yourself and making time to unwind and practice stress management and relaxation techniques can also go a long way to ensuring harmony and balance in the brain and nervous system. Natural remedies have been used for centuries to support the health of the brain and nervous system and provide a safe and effective way of maintaining wellness without the risk of side effects or toxic damage to the liver. Epi-Still is a 100% safe and effective natural remedy for preventing and treating seizures. Due to the high safety profile of all the ingredients, Epi-Still will not cause any side-effects or damage to the organs like so many synthetic medications do. This remedy can be used effectively in isolation for people who are not currently using prescription medications or can be taken in combination with anticonvulsant medications to improve their effectiveness as well as to allow for lower dosages and subsequently fewer side-effects. The gentle and natural ingredients of Epi-Still may take several weeks to take full effect and, as with most natural remedies, regular dosage and a little patience is required in order to see the full benefits. Passiflora (Passionflower) is a herb used widely for anxiety and stress and is also useful for calming an overstimulated nervous system. Passiflora is effective in both the prevention and treatment of seizures, especially when stress is a precipitating factor. Scuttelaria laterifolia (Skullcap) is a well-known calmative and antispasmodic herb and will help to reduce over-stimulation that can lead to seizure occurrence. Also helpful in lowering fever and regulating blood pressure. Cuprum metallicum (30C) is a homeopathic ingredient which is recommended for the control of seizures and also addresses post-ictal drowsiness, mental dullness and vomiting. Cicuta virosa (30C) is another homeopathic remedy which has proven results in treating seizures, especially those characterized by rigidity and/or jerking movements. This remedy is also often prescribed to relieve breathing difficulties and hypersalivation and to address the decreased level of consciousness associated with seizures. Epi-Still contains less than 1% pure pharmaceutical grade ethanol when diluted as directed and contains no gluten, artificial colorants and preservatives. 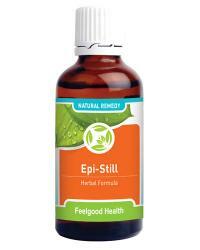 Epi-Still comes in a convenient tincture (drop) form and is available in 50 ml bottles. Adults and Teenagers: 15 - 20 drops in approximately 1/4 cup water or juice three times daily. An additional dose may be taken at the first warning signs of acute symptoms. Children: One drop per age year of the child diluted in ¼ cup of water or juice three times daily. Safety during pregnancy and nursing has not yet been established. Please consult your doctor before making any changes in current medication. Concurrent use with Triple Complex Nerve Tonic is highly recommended. For people currently taking prescription anticonvulsants, we also recommend our Liver Dr. formula in order to help protect the liver from possible harmful effects of the pharmaceutical drugs. When used acutely, Epi-Still should take effect almost immediately and the seizure will resolve more quickly than usual and have less severe after-effects. When used regularly on a chronic basis, Epi-Still will gradually decrease the frequency and severity of seizures over time. One 50 ml bottle will last approximately 30 days at chronic dosage. A 90-day supply (see the Buy 2 Get 1 FREE special) would be three bottles. Epilepsy is one of the most common nervous system disorders and can afflict individuals of any age, race or gender. In the US, more than 2.7 million people suffer from epilepsy and each year about 180 000 people will develop seizures and epilepsy for the first time. Seizures are a symptom of epilepsy. Epilepsy is a disorder which describes a predisposition of the brain to produce sudden bursts of electrical activity that trigger what we know as a seizure. An individual may have a single seizure and not be diagnosed with epilepsy as the seizure may be an isolated incident related to a number of factors e.g. lack of oxygen or a head injury. A first-time seizure is an indication for a thorough medical evaluation in order to establish the likelihood of further seizures and create a plan of action to minimize this likelihood. What should I do if I suspect someone in my family is having seizures? If you think a family member (or even you) might be having seizures, it is important to consult with your family doctor. Try to keep a record of what you notice in terms of unusual behavior, movements etc. - as well as how often this occurs, the time of day it happens and during what activities. These facts will greatly assist your health care practitioner in his/her evaluation of your loved one and will provide valuable clues about whether what you have noticed does indeed indicate a type of epilepsy. Individuals with epilepsy can help to prevent seizures by taking all prescribed medication or natural remedies regularly, maintaining regular bedtime and sleep routines, eating a healthy diet and avoiding unusual stress as much as possible. A good multi-vitamin supplement is recommended, especially including Vitamin E, Vitamin B Complex, Calcium, Magnesium and Manganese - as these nutrients have been shown to play an important role in reducing seizures and promoting neurological and brain health. If you have identified any seizure triggers (e.g. flashing lights) try to avoid these as much as possible. Can I take Epi-Still with my regular, prescription drugs for epilepsy? Yes, you can but only under the supervision of your health care practitioner. Using Epi-Still alongside your medication(s) should allow your health care provider to lower your dosage of the prescription drug. This will mean fewer side-effects and less chance of liver damage in the long-term. For individuals using prescription antiepileptics we recommend our Liver Dr. remedy to improve liver health and functioning, which may be compromised by these medications.